It is an anomaly of Malaysia , where we think our East Malaysian counterparts are closer to Brunei ( they are neighbours ) and Singapore ( perhaps the shoppings' great ) as they really are to where they 'should be' ... i.e. the Peninsular ( meaning this side ). Infact there is even some measure of disagreement as to the figure 50 and 44 between East & West ( or are we really that young ah ? ). Sarawak noodles may well tell another familiar story. this one from the all-in-one laksa Xpert Laksa Shack in Giant Kelana Jaya. Definitely an out-of-tune imitation except price @ RM8.90++ . A lookalike in Taman Megah PJ ( Restoran Gembira ) . Kuching laksa it is called. Yes , only in luscious prawny looks @RM4.50. ...as close as you can get Sarawak Laksa . Never mind the price , it tastes and feels just great, finally ! Looks delicious. Those prawns have great color. I never tried this but was told that it's a combination of Penang Hokkien Mee and Curry Mee...is that true? Spare me the geography leh! 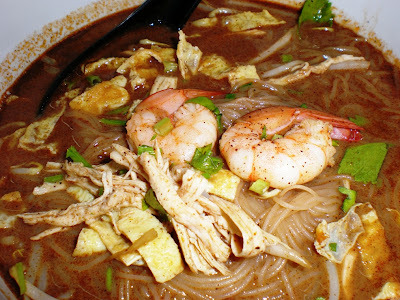 Sarawak Laksa?? No try b4 wor!! Hmmm write down somewhere first!!! I only learn of Sarawak laksa when I at in Laksa Shank.. So many types of laksa. 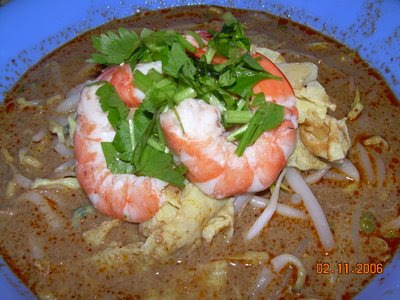 i could hv guessed a 100% from 'top to bottom' of this laksa post of yours...lol. yeah, bangsar's the one! well. 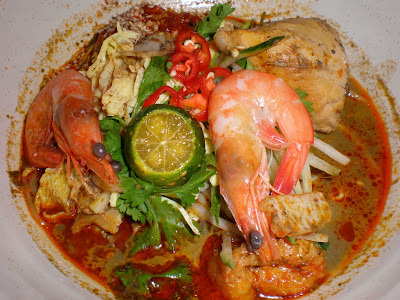 i know it's bout laksa..
but i can't take my eyes off all those fatty-licious prawns. YUM!! Yes, Nam Chuan is my fave source for Sarawak Laksa! Amazingly, I have yet to try the Nam Chuan's despite working so nearby! they should have called it sarawak prawn noodle since the prawns are so prominent ! there is no prawny taste at all in the soup which tastes of a mild form of curry so it is a dish by itself tho a little sour. but it is good ! looks like yr must try dish is getting very very big lah ! if it is not the best we give you a refund...but only after you treat us Lim mee yoke SS@ LOL ! then you should love Champs prawn mee with giant prawns @RM18 ! commercially we believe the expert is filling a critical void for halal chinaman styled noodles don'tyou think ! 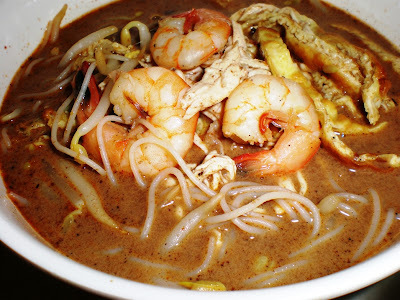 Has anyone tried the sarawak laksa at hai siang kopitiam in puchong? we have noted this shop TQ !